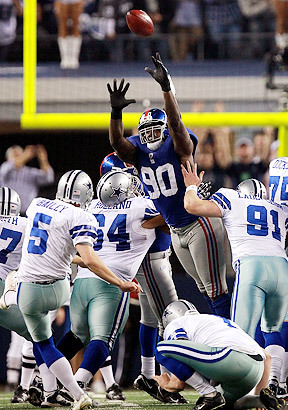 Jason Pierre-Paul’s block preserved a 37-34 Giants win in 2011. The New York Giants and Dallas Cowboys meet today in a 4:25 PM EDT contest on Fox Sports. The NFC East rivals have met 105 times so far with Dallas holding a 59-43-2 edge and are the winners of the last two meetings. But this is about the the three most memorable wins for the Giants over the Cowboys since Manning and Romo became their team’s starting QBs. Dallas finished the regular season as the NFC leaders with a 13-3 record, three games ahead of the second place Giants. It earned Dallas a bye in the first round and the home field advantage throughout the NFC playoffs. The two regular season meetings between the two squads resulted in a pair of Dallas wins – a 45-35 shootout on the first Sunday night of the season and a 31-20 Dallas win in week 10. The final statistics of the playoff game showed Dallas with a 336-230 advantage in total yards and and 36 1/2 minutes of possession to the Giants 23 1/2. But the final score showed Giants 21 Cowboys 17. The Giants took less than three minutes to get on the scoreboard first. Starting on their own 23, the Giants quickly moved towards midfield. Facing a 3rd-and-five from their own 43, Manning’s pass to Amani Toomer fell incomplete, but Cowboys defensive end DeMarcus Ware was flagged for being offside. After Manning converted a 3rd-and-one, he found Toomer for what appeared to be a 10-yard completion. But the Giants’ wide receiver slipped two tackles, got a big block from fullback Madison Hedgecock and raced to the end zone for a 52-yard touchdown. The drive consumed 2/3 of the Giants total yards for the day. The Cowboys answered back with a 96-yd drive that began late in the first quarter and ended on the first play of the second quarter when Romo found Terrell Owens in the end zone for a 5-yard touchdown. It was a well thrown ball that went over the top of cornerback Corey Webster and settled in Owens hands just before he stepped out of bounds. The play was challenged by Giants’ coach Tom Coughlin, but was held up by review. The Cowboys took the lead with 1:01 left in the first half on a Marion Barber 1-yard score, but the Giants move 71 yards in 36 seconds. Manning hooked up with Steve Smith on passes of 22 and 11 yards, with 15 more yards tacked on the latter play thanks to face mask penalty on DB Jacques Reeves. On 3rd-and-10, Manning found tight end Kevin Boss for 19 yards to the Cowboys’4-yard line where Manning found Toomer again to tie things up at 14 apiece. Nick Folk‘s 34-yard FG gave the Cowboys a 17-14 lead after three quarters. After the teams exchanged punts, the Giants began the last scoring drive of the game. R.W. McQuarters returned the Cowboy’s punt 25 yards to the Dallas 37-yard line. Six plays later, Brandon Jacobs punched it in from the one to give the Giants a 21-17 lead. The Cowboys were forced to punt in their first two possessions of the final quarter, but a Matt McBriar punt trapped the Giants back on their own 12-yard line with 3:46 left in regulation. The Cowboys defense got the job done – holding the Giants to a three-and-out – and took over at the Giants 48 after a Jeff Feagles punt. Romo found tight end/Giants killer Jason Witten for 18 yards to the Giants 22-yard line, but Dallas faced a fourth down after a short gain and two incompletions. Romo threw into double coverage in the endzone in attempt to find Terry Glenn, but McQuarters intercepted the pass to seal the Giants victory. The Giants then beat Green Bay on the road and topped the previously unbeaten New England Patriots in the Super Bowl. The week 13 matchup had a big impact on the three-way battle between the Giants, Cowboys, and Eagles for the NFC East lead . The Cowboys entered the game at 7-5, while the Giants struggled their way to a 6-6 mark through 12 games. The game was about offense, with more than combined 700 total yards. Mannings’ 47-yard TD pass to Mario Manningham had given the Giants a 22-20 lead after three quarters. But the Cowboys first drive of the 4th quarter resulted in a TD that took less than two minutes to complete. The big play was a 74-yard completion from Romo to receiver Laurent Robinson that set up a 6-yard TD pass to Miles Austin. On the ensuing drive, the Giants moved from their own 20 to the Dallas 22, but Manning’s pass for D.J. Ware was picked off by Sean Lee and return 30 yards to the Giants 49. After a 1-yard loss, Romo and Dez Bryant hooked up on a 50-yard touchdown pass that put Dallas up 34-22 with just 5:52 to play. The Giants quickly countered back with a pair of completions to Cruz and another to Hakeem Nicks that moved the ball to the Cowboys 32. A 24 completion to Nicks gave them a first down at the Cowboys 8-yard line. Two plays later, Manning connected with tight end Jake Ballard to cut the lead to 34-29 with 3:20 left in the 4th. The Giants had two timeouts and the two minute warning remaining when the Cowboys got the ball at their own 20-yard line following a touchback. The Giants got what they needed, a three-and-out series, and Coughlin used one of his remaining timeouts to stop the clock. A poor punt by McBride gave the Giants the ball at their own 42 with 2:12 left in regulation. Manning hit Ballard with a 21-yard completion and then the Giants moved five more yards on Ware’s second offsides penalty of the game. With the ball on the Dallas 24-yard line and incomplete pass was negated by a defensive holding penalty on cornerback Frank Walker. The automatic first down moved the ball to the 19 and then Manning found Ballard again for an 18-yard gain to the 1. Now it was Dallas’ turn to burn their second timeout with one minute left in regulation. On his second attempt, Brandon Jacobs carried the ball across the end zone for a go ahead touchdown. The Giants tacked on a two-point conversion when DJ Ware went through right tackle to find the end zone. A 12-point deficit turned inito a 3-point Giants’ lead in four minutes-fifty seconds. The Cowboys would have one more shot to keep the game going on the leg of rookie Dan Bailey, who is still a member of the Cowboys today and one of the best kickers in the league. With the aid of 22- and 23-yard completions to Miles Austin, Romo led the Cowboys from their own 20 to the Giants 29-yard line in 38 seconds. Romo spiked the ball to stop the clock with eight seconds remaining in the 4th quarter as Bailey trotted on to the field. Just before the ball was snapped, the Giants used their final timeout. Already in motion, Bailey kicked the ball right down the middle, but the field goal didn’t count. On his second attempt, the Giants’ Jason Pierre-Paul partially blocked the kick and the Giants had their victory. The final game of the season would determine which team, the Giants or Cowboys, would go to the playoff and which team would go home. Both teams entered the January 1, 2012 contest with 8-7 records. The game was three weeks after the Giants surprise come from behind road victory in Dalass. Unlike their previous meeting, however, this game was primarily in the Giants control.. With the game scoreless midway through the 1st quarter, the Giants got the ball on their own 4-yard line. Manning completed a 3rd-and-9 pass to tight end Bear Pascoe to keep possession of the football. In the previous week’s win over the New York Jets, Cruz took a short pass and turned it into a 90-yard TD reception. Against the Cowboys he did it again. On 3rd-and-1, Manning found Cruz at the Giants 31-yard line. With the help of a block, the sasa-dancing receiver blew past the defense and ran 74 yards for the first score of the day. The Giants quickly got the ball back when defense held the Cowboys to a three-and-out. The Giants used a 10 play drive that spanned the first and second quarters to take a 14-0 lead. Ahmad Bradshaw finished the drive off with a 5-yard TD run. The Giants last possession of the half resulted in another Bradshaw touchdown. The Gmen went 80 yards, thanks in part to a Bradshaw 29-yard run, and scored when Manning tossed a short pass to Bradshaw that resulted in a 12-yard TD. Bailey had a rare miss, from 52 yards, to keep Dallas off the scoreboard in the first half. The Cowboys finally came alive in the third quarter. On their first possession, which began at their own 6-yard line, Dallas drove to the Giants’ 34. Romo then hooked up with Robinson for a 34-yard scoring play. The score would remain 21-7 until the 4th quarter when the Cowboys took over at the Giants 26-yard line after a short Steve Weatherford punt and a 13-yard Dez Bryant return. Three plays later, Romo and Robinson again combined for a score, this time a 6-yard TD pass. Up 21-14, the Giants suddenly found themselves in a much tougher situation. A Lawrence Tynes‘ field goal added some breathing room and the Giants held the Cowboys to a punt on the ensuing possession aided by a Chris Canty sack. Chris Jones shanked the punt and the Giants got he ball at the Cowboys 45-yard line. After a couple of Bradsaw runs netted five yards, Manning threw to Nicks for a 36 yard gain to the Cowboys 4. After a Dallas timeout, Manning went to Nicks again for a touchdown. The Cowboys got the ball back, down 10 with 3:46 remaining in regulation. The Cowboys got out to their own 46 before Justin Tuck strip-sacked Romo and the Giants’ Matthias Kiwanuka fell on the ball to put the finishing touches on the Giants win. The Giants topped the Falcons at home, Green Bay and San Francisco on the road, and topped the Patriots in the Super Bowl for the second time five seasons. 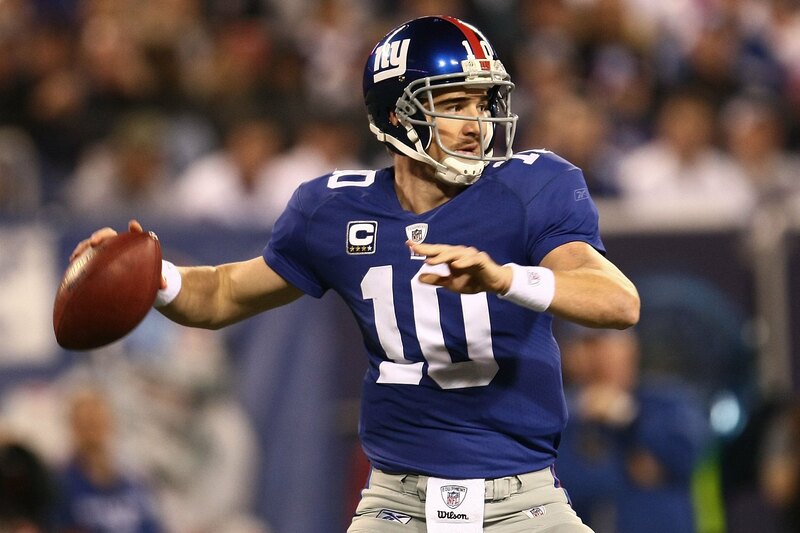 2014 NY Giants Preview: Can Eli Still Make Fans BELIeve? Eli Manning must stay on his feet and keep the ball out of the opponents’ hands if the Giants are to make the playoffs. Tom Coughlin’s tenure as head coach of the NY Giants has seens its ups and downs. Those same highs and lows have been experienced by his starting quarterback, Eli Manning. Despite two Super Bowl victories, each of which saw Manning take home the game’s MVP Award, the Giants are in a period of transition. One that could cost both Coughlin and Manning if things don’t work out right. Based on the pre-season, the Giants have their work cut out for them. The Giants counted on running back David Wilson to be an integral part of their offense in 2013, but the former stand out at Virginia suffered a season ending neck injury and was forced to retire after a scare during training camp this year. Andre Brown missed half of the 2013 season, but led the team with 492 yard rushing. With his departure as a free agent, the Giants turned to Jennings, who rushed for 723 yards for the Oakland Raiders and looked sharp during the exhibition season. With the retirements of Chris Snee and Dave Diehl, and the departure of ineffective center David Baas, Schwartz was a major signing to bolster an offensive line that was one of the weakest links on last season’s team. Unfortunately, Schwartz suffered a dislocated toe during the exhibition season and will miss the first half of the season. The Giants secondary is one of the deeper area’s on this year’s squad, but the acquisition of Rogers-Cromartie give the Giants another top cover guy. He’ll need to be since he’s not particularly physical or consistent. The Giants linebacking corp are many years removed from the LT years, Jessie Armstead, and Aaron Pierce. Jon Beason was a great addition last year and the Giants hope they can get big-time production from McClain, an excellent run stopper. Round 2: Weston Richburg, C, Colorado St. Round 5: Nat Berhe, S, San Diego St.
Beckham is being heavily counted on to take pressure off the Giants’ number one playmaker, Victor Cruz. Unfortunately, Beckham missed the pre-season with a bad hamstring and won’t suit up in week 1. Richburg was a nice choice for an offensive line that needed help. With the injury to Schwartz, Richburg is going to have to adapt quickly. Bromley joins a line that struggled last year to get to the quarterback last season. A Giants’ fan growing up, Bromley is expected to use his strength and speed to clog up the middle. Williams could eventually emerge as the team’s number one back this season. That will all depend on the success or failure of Jennings. Either way, Williams should get a good amount of carries in reserve. Berhe adds more depth to a deep defensive backfield. Extremely athletic, Berhe could have a big impact down the road. Kennard is a physical player that the Giants will need to contribute immediately. Linebacker continues to be a weak spot on the Giants roster. Jackson will start the season on the practice squad. The biggest addition to the Giants is new offensive coordinator Ben McAdoo. For years, fans have been all over Kevin Gilbride, not affectionately known as “Killdrive” by his detractors. McAdoo brings his version of the west coast offense to a team that has relied on deep QB drop backs and long passes from Manning. The first string offense, particularly the passing game, was a disaster during the exhibition games. The quicker the offense adapts to McAdoo’s schemes, the more successful the team will be. So far, a .500 record might be a stretch. Jennings, Williams, and Peyton Hillis will need to run the ball effectively to give Manning time to find his receivers. The heaviest pressure is on the re-tooled offensive line to open holes for the aforementioned trio and to keep Manning off his back. Versatile fullback Henry Hynoski returns after missing most of last season due to injury. Rueben Randle continues to not be on the same page as Manning. At times, Randle looks spectacular; at other times he looks completely lost. Beckham’s injury couldn’t have come at a worse time for an offense in transition. The Giants tight end position is up in the air after another free agent, Brandon Myers, left after one year. Larry Donnell, Daniel Fells, and Adrien Robinson are the underwhelming trio that will split time at tight end, at least until someone better comes along. The new line, for now, has J.D. Walton at center with Will Beatty and Richburg filling out the left tackle and guard positions. Brandon Mosley starts at right guard with second year man Justin Pugh getting the nod at right tackle. In addition to Cruz and Randle, Jerrel Jernigan, Preston Parker, and Corey Washington are the other wideouts. Washington could be the break out star of latter trio. The key to the Giants defense has been to put pressure on the opposing quarterback. When the line and linebackers get in the quarterback’s face, the Giants coverage in the secondary holds and makes run stopping easier. The pass rush was one of the team’s biggest weaknesses last season. The primary reason the team was 23rd in the NFL against the pass. The squad finished tied for 25th in the league in sacks. Veteran leader Justin Tuck is gone and Jason Pierre-Paul is coming off a season in which he struggled post-back surgery. Mathias Kiwanuka, who has played linebacker as well for the Giants, will lineup at the opposite end of Pierre-Paul. Damontre Moore will fill in, in pass rushing situations. Cullin Jenkins and Johnathan Hankins are plugged in at the tackles spots, with Bromley spelling them. Jon Beason begins the season with a foot injury, but will start at middle linebacker. He’s also one of the team leaders. Mcclain and Mark Herzlich will back him up. Jacquian Williams starts at the weakside with Kennard lined up at on the strong side. Spencer Paysinger will see some time as a back up and will be a regular on special teams. The defensive backfield is deep with Rogers-Cromarte and the ever-improving Prince Anukamara at the corners and Stevie Brown, back from knee surgery, at free safety. Veteran mouthpiece Antrel Rolle, who had one of his best seasons in 2013, returns at strong safety. He’ll serve as a good mentor for Berhe. The Giants’ special teams have struggled over the years, particularly at stopping the opposing returner. The Giants return men was nothing special last season, as the team finished in the bottom five of all teams. Due to injuries and ineffectiveness, the Giants have tabbed Parker as the punt returner to being the season. Quinton Demps gets the nod on kick returns, with Parker as his backup. Kicker Josh Brown and punter Steve Weatherford return to their respective positions. The Giants could finish in second place in the NFC East this season and not come close to a playoff spot. That’s because of how flawed the teams in the division are. There’s plenty of pressure on head coach Tom Coughlin, quarterback Eli Manning, o-coordinator Ben McAdoo, and DE Jason Pierre-Paul to turn things around from last season’s medicore 7-9 mark. It will be far from easy, 8-8 looks about as good as the team will be. It’s not out of the question that the Giants will split their six division games against Dallas, Philadelphia and Washington. But Seattle, Indianoplis, Arizona, and Detroit are on the schedule, and what should be an improved Atlanta squad. The key to the season is for Manning to keep his turnovers down from the last two seasons. That will at least give the Giants a fighting chance. 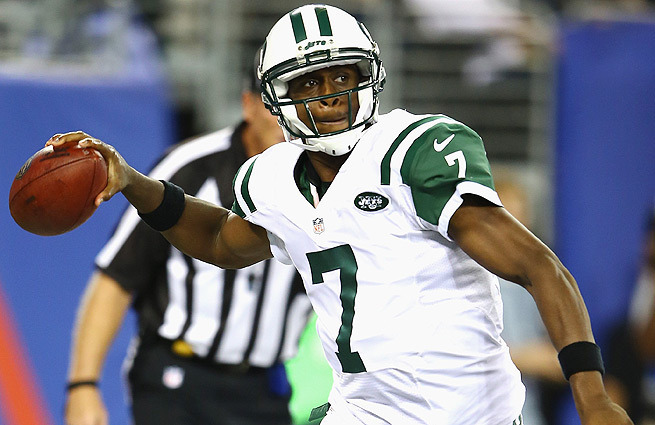 2014 NY Jets Preview: Can Geno Prove His Critics Wrong? Geno Smith will try to lead the Jets back to the post-season in 2014. After a surprising 8-8 finish, Rex Ryan is back for his sixth season as the head coach of the New York Jets. With limited talent on the offensive side of the ball and a rookie quarterback starting all year, Ryan and the Jets found a way to finish .500. Decker was the first free agent addition for the Jets, signing a five year contract worth 36.25 million dollars (15 guaranteed). Vick was brought in on a one-year deal to be Geno Smith’s back up. Chris Johnson was cut by the Titans well into free agency and was brought in on a two-year deal worth an $8 million dollar base salary (up to $1 million in incentives). Dmitri Patterson was signed after the cornerback market completely fizzled on a one-year deal. Then he fizzled too, going AWOL during the pre-season and was released. The Jets made no attempt to bring back Cromartie and failed at coming to terms with Howard, who was paid a king’s ransom by Oakland to move from right tackle to guard. Mark Sanchez and Santonio Holmes were cut by the Jets after failing to live up to mega contracts they received from former general manager Mike Tannenbaum. Pryor will start at one of the safety spots. He was brought in to improve the Jets turnover differential and overall turnovers, both categories of which the Jets were in the bottom 5 of the league. Amaro will receive significant (starter level) reps at both tight end and split out wide. His blocking is much better than he is given credit for, while being a red zone target from day one. Mcdougle is lost for the year with a torn ACL injury and will look to compete for a starting corner spot in training camp in 2015 after rehab. Jalen Saunders is the starting punt returner and fifth wide out on the team. Shaq Evans has been put on IR for the year. Dakota Dozier brings depth to the interior offensive line positions. George has struggled in the preseason and is currently on the roster bubble. If he does make the team, he is the backup for Demario Davis and David Harris. Dixon is a project cornerback that will most likely land on the practice squad in year one. He has excellent speed (top 5 40-yard dash time at the 2014 NFL combine) and experience in man-to-man press coverage. If he can refine his lateral movement and flipping of his hips, he will see the field in 2015. Enunwa is a big red zone threat (6’2, 225 pounds) and a nasty blocker. He will most likely land on the practice squad as his route running needs work, unless he can stick on special teams. IK Enemkpali is a power rusher that played at a lower level of competition at Louisiana Tech. He can step in on special teams as a rookie while working on a role as a situational edge rusher for the 2015 NFL season. Matt Simms beat out Boyd for the third string quarterback spot, though Simms is merely on the practice squad for now. Trevor Reilly played every position except nose tackle in the front seven at Utah. The versatile 26 year old is a special teams candidate for the Jets in 2014. Geno Smith will be the starting quarterback, as he looks to carry his strong finish from 2013 into the 2014 season. There is a lot to like about Smith, who was forced into a starter’s role after Mark Sanchez suffered a season-ending injury in the 2013 preseason vs. the Giants. Smith has a strong, accurate arm and + graded mobility. He is a “down field” thrower that needs to refine his reads and footwork. After being given a full NFL offseason, Smith should have a better grasp on the playbook and reading of an NFL pass rush. I would temper expectations going into year two, but 18 passing touchdowns, 4 rushing, and 12-15 turnovers are very fair expectations for Smith. The Jets will rely on a run-heavy attack featuring power back Chris Ivory, speedster Chris Johnson, and the one cut runner in Bilal Powell. Ivory is a load when healthy and a goal line menace. Johnson can bounce it outside and bring it to the house on any play, from handoffs or passes. Powell is the best pass-protecting back on the team and displays very good vision to find the hole, cut and go. Daryl Richardson will also be featured in case one of the top three are injured. The speedy back from the Rams is very capable of handling second-string running back duties. Eric Decker will be the primary wide receiver. Jeremy Kerley will handle the slot duties and continue to be the go-to guy on third downs. Jace Amaro and Jeff Cumberland are extremely capable pass catchers that can line up as in-line tight ends as well, although Cumberland has struggled mightly as a blocker in the past. David Nelson will be a short-intermediate possession target, while Greg Salas will most likely back up Kerley. Jalen Saunders will handle returning punts and occasionally work out of the slot if he develops as a NFL pass catcher this year. Stephen Hill’s status with the team is up in the air as he continued to struggle in the preseason. The offensive line will feature mainstays D’Brickashaw Ferguson and Nick Mangold with free agent addition Breno Giacomini. The guards will be Brian Winters and Willie Colon, with Oday Aboushi as a primary do-it-all back up. Giacomini and Colon are bruisers that lack a lot of foot speed but can maul when they get their hands on defenders. Ferguson is the blindside protector who handles the primary edge rushers. Mangold is as solid as they come, after he did not allow a single sack in 2013. Winters is the guy to keep an eye on as penalties and pass protecting seem to be key struggles in his game right now. The defense is led by young talent along the line in Mo Wilkerson, Sheldon Richardson, and Damon Harrison. Calvin Pace and Quinton Coples will start at the outside linebacker positions, with Jason Babin being the situational pass rusher. Antwan Barnes is still working his way back from a 2013 knee injury. Rookie Calvin Pryor and veteran Dawan Landry will start at the safety positions. The cornerback positions are anyone’s best guess at the moment, outside of Dee Milliner being a lock. Darrin Walls is an extremely capable outside coverage corner who seems to be the front-runner to line up across from Milliner. Antonio Allen will see time at both safety and corner, wherever the Jets need him. Kyle Wilson will most likely play a slot corner position. Bruiser David Harris and youngster Demario Davis lead the middle of the defense. Harris struggles considerably in coverage but plays the interior run as well as anyone. Davis is a sideline-to-sideline linebacker that could lead the team in tackles in 2014. First-year coach Thomas McGaughey from LSU will look to improve the Jets special teams in 2014. Jalen Saunders will be the primary punt returner, with Jeremy Kerley serving as his back up. Kick returner will be a week-to-week position depending who is on the roster. Jacoby Ford, Saalim Hakim, and Clyde Gates can all handle kick return duties. The question is, which one makes the roster, if any? Nick Bellore is the special team’s “stand out.” Bellore is a tackling machine that always seems to have his nose on shutting down returns. Nick Folk has been as reliable as they come for the Jets, hitting 33 out of 36 field goal attempts in 2013. Ryan Quigley is a huge question mark at punt returner, and the Jets should look to replace him after cuts. Long-snapper Tanner Purdum seems like a lock. The Jets made a lot of offseason improvements and will look to build off of their 8-8 finish in 2013. Right now I have them finishing 9-7, just missing the playoffs due to a very strong AFC in 2014. The most important factors for the team will be Geno Smith’s development and the secondary containing the big play, two week-to-week issues they faced last season. Connor Rogers works in Bleacher Report’s NFL Video Department and is a lead editor for Turn On The Jets. He has been featured on newyorkjets.com and many more outlets. You can follow him on twitter at @CRogers_NFL.